Kathryn Wilson put on a masquerade to showcase her authentic shoe range on Wednesday at New Zealand Fashion Week. Dressed in sparkly red ensembles, the models walked down the runway to the sound of a live band. M.A.C. 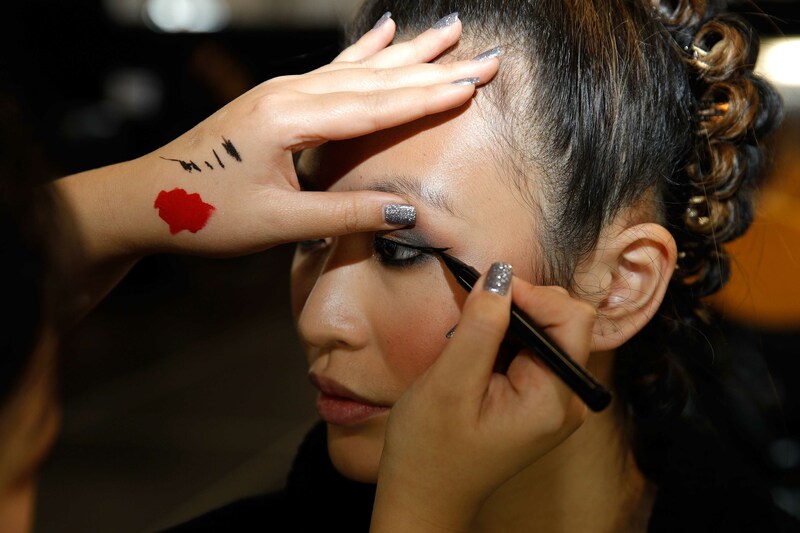 Cosmetics was behind the glamorous beauty looks for this show. Marching band meets Chicago was the inspiration behind this feminine makeup, with a bold cat eye and bright red lips. Indianwood Pro Longwear Paintpot topped with Carbon eyeshadow were featured on the eyes, paired with a mix of Reflects Gold Glitter and Iridescent White Glitter. Extra Dimension Skinfinish in beaming blush and telling glow were used on the cheeks. Finishing the iconic look was the Retro matte Liquid Lip Colour in Feels So Grand.